Defend Swaziland unions! Free Mario Masuku! Mario Masuku, jailed president of the People's United Democratic Movement. 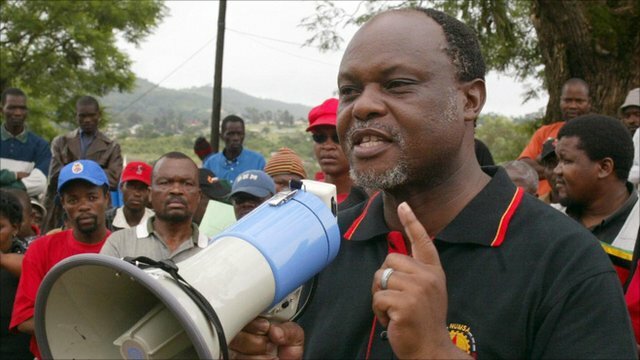 March 17, 2015 -- Congress of South African Trade Unions, posted at Links International Journal of Socialist Renewal -- The Congress of South African Trade Unions strongly condemns recent violent attacks by Swaziland police on trade union meetings and sends a message of solidarity and support to the Swazi workers struggling for democracy and the right to organise in free and independent trade unions. On March 14, 2015, King Mswati’s police broke up a meeting of the executive board of the Trade Union Congress of Swaziland (TUCOSWA), and injured a union leader who was taking part. According to TUCOSWA leaders and the Swazi Observer, more than 300 plainclothed police forced participants to end the meeting in the Swaziland National Association of Teachers (SNAT) Centre and blocked the gates to the building. TUCOSWA has reported that Muzi Mhlanga, SNAT secretary general, was assaulted and had to seek medical care. “The police came in as if they were coming to fight an army”, said TUCOSWA secretary general Vincent Ncongwane. “They actually manhandled us, stopping anyone coming in or going out of the venue”, he said in a letter to the minister of labour and other government officials to make them aware of the events and seek redress. Swazi police also broke up a national union meeting on February 28 on the grounds that workers were discussing democracy. For three years TUCOSWA’s applications for legal re-registration under recently amended Industrial Relations Act have been rejected. The federation is however getting key support from religious leaders. A coalition of Christian churches has called for the registration and recognition of TUCOSWA, as part of its broader call for multiparty democracy to address the Swaziland’s political, social and economic crises. Meanwhile Mario Masuku, president of the People`s United Democratic Movement (PUDEMO), remains gravely ill in jail after being arrested and charged with Terrorism on May 1, 2014, at Manzini Salesian Sports Ground after he delivered his speech at the May day celebration. He highlighted the key challenges facing a country held at ransom by oppressive monarchical rule, fraught with unfair economic, political and social policies, all meant to defend and promote the interest of a feudal dynasty called Tinkhundla system. The basis of his charge, together with that of Maxwell Dlamini, secretary general of the Swaziland Youth Congress (SWAYOCO), was that he contravened the suppression of terrorism Act No 3 of 2008 by chanting slogans and singing songs which sought to promote a terrorist entity as per the said Act. The exact slogans and song were "Viva Pudemo Viva" by Mario and "We don`t want this system, we don`t want this system" by Maxwell. If found guilty they both face 15 years of hard labour in prison without any option of a fine. They have already spent 10 months behind bars without their case being heard, as the Swazi government continues to delay the trial deliberately through endless remands, citing unfinished investigations. They have refused to grant them bail twice, even after South African advocates from Cape Town made a ground-breaking appearance. They told the court that Mario is quite old (65), diabetic and is not in good enough health generally to continue languishing in jail. His health has since deteriorated rapidly and his condition is now critical. Judge Simelane however rejected the appeal, declaring the leaders flight risks and a threat to national security, and ordered them to be returned to prison. The same judge again refused bail two months later despite lawyers appealing on the new grounds of Mario’s deteriorating health after he caught pneumonia in prison, where conditions are deplorable. “The conditions of Zakhele Remand Centre are not at all favourable for anyone. Windows remain broken with spy holes exposing occupants to either cold weather in winter or extremely hot weather in summer as this dungeon is geographically located on the outskirts of Manzini, the heart of the middle veldt of Swaziland. “Food is usually of poor diet dominated by starch mainly porridge, cabbage and beans throughout the week, badly cooked by convicts serving lengthy jail terms. The conditions above can only exacerbate the diabetic condition of Mario which has not only led to him suffering from pneumonia in August last year for well over a month but equally caused him to develop a terrible wound in his right heal. “Prison authorities refused him medical attention arguing that Panados were enough to heal the wound, while blocking private doctors sanctioned by his family and organisation. “We raised the alarm through South African media about his state of health and hostile prison treatment, at which they then took him to the government hospital in Mbabane. This has not helped as doctors even today have not been able to treat his wound as his diabetic condition is said not to be stabilising to enable treatment. “His family, particularly his wife, who has to check on him almost daily travelling the 45 km, is too often made to wait outside for sometimes 2 hours as they secure the so-called ‘senior warders’ to supervise visits to Mario and Maxwell respectively. “Leaders of his organisation have been banned from visiting him and Maxwell, citing lack of staff to supervise. His lawyer has been allowed but to consult but for not more than 30 minutes per consultation. “Mario`s son, who has recently been admitted as an attorney of the high court and part of the legal team, has been refused his status of lawyer in that prison so as to enjoy private consultation with his client but can only go in as his son so that warders can listen to their conversations. COSATU national office bearers are making plans to visit Mario Masuku as urgently as possible but are well aware that they could be denied entry by the regime. 1. The unconditional release of all political prisoners. 2. The right of all to organise freely. 3. Re-registration and recognition of TUCOSWA. 4. Unbanning of political parties. 6. Unconditional return of all exiled activists.